STORY: Stand-in skipper of India, Rohit Sharma, cracked a blistering half-century as India outclassed New Zealand by seven wickets in the second Twenty20 international on Friday (February 08) and leveled the three-match series at 1-1. 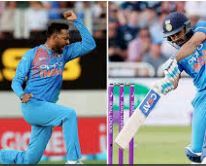 Indian cricketer, Khaleel Ahmed said, the team will try to win the series with the players improving in both batting and bowling departments. The final T20 will take place in Hamilton on Sunday(February 10) .